I didn’t care about any of the posts that described activities on Facebook. It doesn’t matter to me if $friend changed their profile picture or liked someone else’s status update. I was interested in two link posts but I had already seen the exact same links on Twitter hours earlier. People tend to create albums of mediocre photos on Facebook while they only post their best on Instagram. Many of my Facebook friends have Instagram accounts and I already follow the ones I’m interested in. 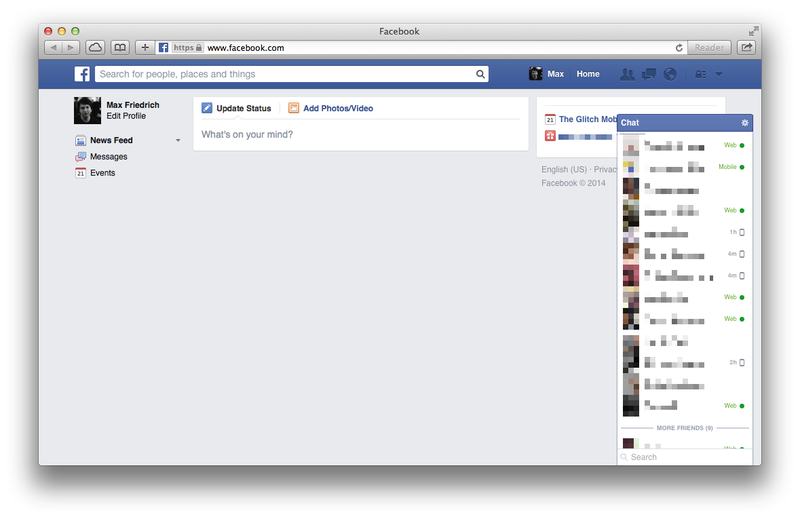 I’ve been using “Quiet Facebook” for a week now and I’m happy with it, so I put the CSS on GitHub. I just embed the stylesheet via Safari’s settings but someone could certainly build browser extensions that load the stylesheet from raw.github.com and toggle it when the user clicks a button. Feel free to submit pull requests (or suggest a better name for the whole thing)! Update May 24: Chrome and Firefox users can install the stylesheet via Userstyles.org, using the Stylish extension. Safari users: Download the CSS from GitHub, open Safari Preferences, Advanced, select downloaded file in Style sheet dropdown.